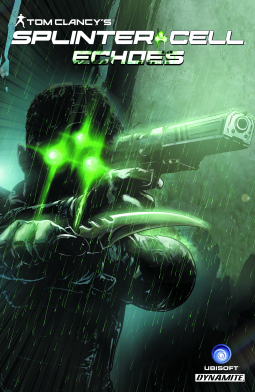 Kudos to the team behind TOM CLANCY’S SPLINTER CELL: ECHOES; they picked the perfect writer to adapt their mega-popular video game character into a four-issue comic book series, published as a collected edition in November 2014. Nathan Edmondson proved himself adept at translating the spy / political intrigue genre to comics with his creator-owned series THE ACTIVITY, and with SPLINTER CELL: ECHOES he does much the same, presenting readers unfamiliar with the Splinter Cell brand with a fun, action-packed thriller, while adding to the Sam Fischer mythos, thereby satisfying the desires of the passionate fan base. ECHOES takes place between the events of the video games Splinter Cell: Convictions and Splinter Cell: Blacklist, but newcomers needn’t fear this backstory; Edmondson provides all the information required to enjoy the story for what it is. Sam Fischer was a Splinter Cell – an elite operative who worked for a clandestine, blacker-than-black wing of the National Security Agency – but he has since retired, hoping to put his life bag. But when a terrorist organization called KROWE surfaces, plotting deadly attacks around the globe with a spectacular endgame in mind, Fischer is called out of retirement. Sure, ECHOES treads familiar territory that we’ve read before. Admittedly there is not much innovation here. Instead, it’s about execution – and the story unravels like clockwork, methodically paced, perfectly illustrated by Marc Laming, who is a no-nonsense kind of artist; simple, but effective layouts, nothing overly stylish about his work, but it gets the point of cross. Ultimately that’s what counts. There are the usual thrills and spills in ECHOES, the close-but-no-cigar moments as Fischer hunts the terrorists, and while it feels familiar, it’s never blatantly derivative. It’s a fine thriller, and undoubtedly the best video-game-to-comic-book adaptation I’ve read.